–Defense makes high-impact plays, but at a cost: Seattle QB Russell Wilson isn’t easy to get to, but the Packers defense made several big plays against him, recording three sacks and two interceptions of Wilson, who played the entire first half and the first series of the second half. Unfortunately, some of those players making the big plays also left the game with injuries. 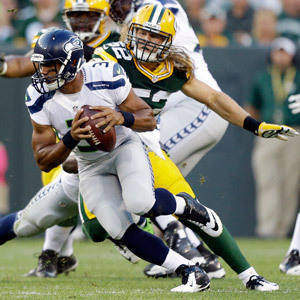 Wilson started hot, converting a pair of third downs with long pass plays on the opening drive, but LB Clay Matthews sacked him for a 12-yard loss in the red zone, leading to a field goal. “He’s going to make his plays, but for the most part, we got after him, got our hands on him and got him down,” Matthews said of Wilson. The defense opened the second drive with another sack, this one by LB Brad Jones, before getting a pair of interceptions on the Seahawks’ last two drives of the first half. The first was by CB Casey Hayward, who was making his preseason debut, off a double deflection by LBs Nick Perry and Robert Francois. Hayward may have come back from his hamstring injury too soon, however. He re-aggravated the hamstring in the game. Jones and S Morgan Burnett also were mentioned by Mike McCarthy after the game as having hamstring injuries. The second interception came from S Jerron McMillian, who made a diving grab of an overthrown ball at midfield. The defense got one more sack of Wilson on the opening drive of the second half, as backup DL Jordan Miller brought him down. Another sack by DE C.J. Wilson three plays later was negated by an offensive holding penalty, which the Packers accepted for the additional lost yardage. Rookie LB Nate Palmer added a sack of backup QB Brady Quinn in the second half, and another sack of Quinn by DL Mike Daniels was nullified by an offsides call on linemate Datone Jones. “From what I understand, our sack numbers jumped dramatically from 2011 to 2012, so I think we were pretty good last year, and I think we’re improving this year,” Daniels said. –Harris limps off: Another notable injury was to RB DuJuan Harris, who got his first preseason action and had three carries for two yards, plus one reception for 11 yards. But after the 11-yard catch, Harris was slow to get up and said afterward his knee was bothering him, the same knee that kept him out of the first two weeks of training camp. “I’m all right,” he said. “I walked off. Everything will be good. –Crosby makes it count: K Mason Crosby bounced back from his three-miss practice on Wednesday to convert his only FG try on the night, from 38 yards in the first quarter. –Finding daylight: In what could be shaping up as a battle for the last RB spot on the roster, third-year pro Alex Green found some daylight on a wide toss play, cutting upfield for 31 yards, more than double the longest rush by a Packers back in this preseason. Assuming Harris plus draft picks Eddie Lacy and Johnathan Franklin make the team, a final RB spot could come down to Green or James Starks, who didn’t get any carries Friday night and was unable to make up for a fumble in last week’s game in St. Louis that led to his removal from the contest.